Saranga Rajaguru struck 60 for March against Kimbolton. Photo: Pat Ringham. March Town appear to have found a gem of an overseas all-rounder in Saranga Rajaguru. Last weekend Rajaguru returned outstanding bowling figures of 7-21 and today (July 7) he made a crucial 60 to set up a five-wicket Cambs Division One win over bottom club Kimbolton. Ryan Evans took 4-31 for Castor against Blunham. March were wobbling at 51-3 when chasing Kimbolton’s 171-4 when Rajaguru was joined at the crease by Adam Conyard. The match had been reduced to 40 overs per side because of England’s unexpected involvement in a World Cup quarter-final. And the pair added 82 before Rajaguru fell after a 64-ball innings which included five fours and two sixes. Conyard (38no) was still there at the end as victory was completeed with almost five overs to spare. March are now above local rivals Ramsey and Wisbech who were both beaten today. The Rams were outclassed by leaders Saffron Walden who reached their victory target of 124 with six wixkets in hand. Number Leighton Gilbert top scored for Ramsey with just 18. And Wisbech slithered to a 60-run defeat at Sawston & Babraham after their hosts were dismissed for 197. Only opener Danny Haynes (59) impressed with the bat for the Fenmen. In Division Two Castor agreed to a 30-over game at Blunham with football spectating in mind and the teams fought out a high-scoring thriller. Blunham posted a strong-looking 180-9, but Castor got home with two balls to spare after fine knocks from Caameron Dockerill (43) and Harley Killingsworth (26no). Castor’s Ryan Evans (4-31) had earlier produced the best bowling of the day. 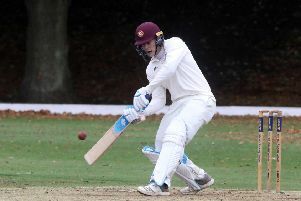 Ufford Park’s poor run of form continued with a four-wicket home defeat at the hands of Granta seconds, while Stamford Town lost by 72 runs at home to St Ives despite a five-wicket haul from university student Daniel Robertson. Kimbolton 171-4 (M. Watkinson 55, S. Malton 50no, A. Wright 2-16). March 173-5 (S. Rajaguru 60, A. Conyard 38no). Ramsey 123 (J. Sneath 3-22). Saffron Walden 126-4 (F. Kirsten 38no). Sawston & Babraham 197 (B. Ellis 3-18, K. Haynes 3-33, G. Freear 2-52). Wisbech 137 (D. Haynes 59). Castor 181-7 (C. Dockerill 43, H. Killingsworth 26). St Ives 196-8 (D. Robertson 5-36, S. Prentice 2-40). Stamford 124 (S. Lem 49, T. Juggins 25). Ufford Park 169 (A. Larkin 32, J. Turp 25, J. Harrington 20). Granta 173-6 (S. Ababasi 62, T. Hussain 3-34).